1. Where should we hike? These are fun questions to answer. 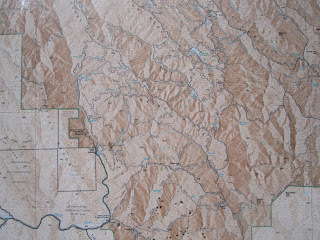 There are hundreds, if not thousands, of destinations in the Sierra, and we love researching them, staring at topo maps, and joining them as they hike the trail in their minds. What fun. The map at right is a photo taken at Henry Coe State Park...and by using the zoom function on the camera, it actually works as a complete trail map. Cool. 2. Will we run into terrible problems? These are easy to answer. Because there are not really any major risks to backpacking in the Sierra. But every year we get so many questions about these. People want to know if they will have problems with bears, or mountain lions, or rattlesnakes, or mosquitoes, or high water or low water or snow or hanta virus….! Bears: Only if you camp in very heavily trafficked areas, and refuse to use a bear canister. Then you might lose your food. Follow the rules, and you’ll be fine. There have been twelve bear attacks in California in the last twenty years. None of them fatal. None in the High Country. Mountain Lions: Far rarer than bears. No attacks in the High Sierra that we know of. Rattlesnakes: Leave them alone, don’t pick them up. Most bites occur to young men on their hands and arms. Ahem. Mosquitoes: yes, there will be mosquitoes. And they can vary in intensity from day to day and season to season. Best is late summer or early fall. Worst is late spring and early summer. Wear bug juice, use a head net when they are really fierce, and camp away from open meadows and wet areas. The more you can get into the breeze, the better you can survive mosquitoes. Yes, those are mosquitoes on M's shorts at 10,000 feet and two miles from the nearest lake. This was in July of 2011---a banner year for the little guys. Above--be prepared! These head nets cost a couple of bucks or so and weigh next to nothing. But when you need them, they are heaven! Water and snow: yes, there will be water and snow this summer. How much depends on what happens in April and May of 2013. The good news? 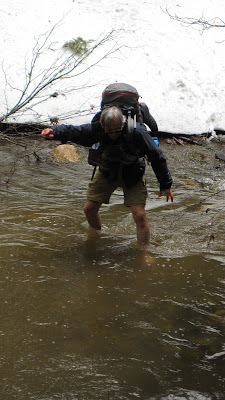 You never have to cross a stream or a snowfield. You can always just go back the way you came. The bad news? High water and slippery rocks are the second biggest killer of people in the Sierra. Every year somebody makes that same mistake. Don’t let it be you. Hanta Virus: Okay, this is a new one, based on the media reports out of the tent cabins in Yosemite. It is a dangerous disease, but it is contracted by breathing the feces and urine of deer mice. Done much of that lately? This is an issue for poorly constructed and badly cleaned buildings in the Sierra. It’s not an issue in the wilderness. Did we miss something? Oh yeah—the single biggest killer of people in the Sierra by far is the ferocious automobile. If at all possible, avoid it!